Yui Horie & Miss Monochrome Return to AX 2018 for a Special Performance! 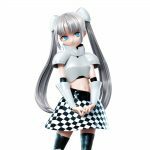 Join fan-favorite virtual star Miss Monochrome as she puts on an incredible musical performance for all her devoted fans on Saturday, July 7th! Voice actress/music artist, Yui Horie, will also be making a special guest appearance. Showmaker Presents: Miss Monochrome & Yui Horie! Showmaker Live: Miss Monochrome & Yui Horie! Yui Horie is a popular Japanese voice actress and music artist. She has released 19 single CDs and 9 album CDs so far. She has had live concert performances in Nippon Budokan in 2009 and in Yoyogi National Gymnasium in 2015. As a voice actress, she has starred in roles which include Anna Kushina from K, Millhiore from Dog Days, Minori Kushieda from Toradora, and Tsubasa Hanekawa from the Monogatari series.